"Quiet" by Susan Cain will change how you think about introverts forever. A "Sunday Times" and "New York Times" Bestseller. Our lives are driven by a fact that most of us can't name and don't understand. It defines who our friends and lovers are, which careers we choose, and whether we blush when we're embarrassed. That fact is whether we're an introvert or an extrovert. The introvert/extrovert divide is the most fundamental dimension of personality. And at least a third of us are on the introverted side. Some of the world's most talented people are introverts. Without them we wouldn't have the Apple computer, the theory of relativity and Van Gogh's sunflowers. Yet extroverts have taken over. Shyness, sensitivity and seriousness are often seen as being negative. Introverts feel reproached for being the way they are. In "Quiet", Susan Cain shows how the brain chemistry of introverts and extroverts differs, and how society misunderstands and undervalues introverts. She gives introverts the tools to better understand themselves and take full advantage of their strengths. Passionately argued, superbly researched, and filled with real stories, "Quiet" will permanently change how we see introverts - and how you see yourself. "I can't get Quiet out of my head. It is an important book - so persuasive and timely and heartfelt it should inevitably effect change in schools and offices". (Jon Ronson, "The Guardian"). "Susan Cain's "Quiet" has sparked a quiet revolution. In our booming culture, hers is a still, small voice that punches above its weight. Perhaps rather than sitting back and asking people to speak up, managers and company leaders might lean forward and listen". (Megan Walsh, "The Times"). 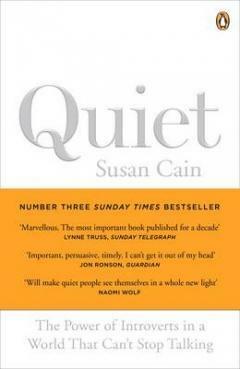 "Quiet is a very timely book, and Cain's central thesis is fresh and important. Maybe the extrovert ideal is no longer as powerful as it was; perhaps it is time we all stopped to listen to the still, small voice of calm". (Daisy Goodwin, "The Sunday Times"). Susan Cain is the owner of The Negotiation Company, a firm that trains people in negotiation and communication skills. Her clients include Merrill Lynch, Standard & Poor, University of Chicago Business School and many of the US' most powerful law firms. She previously practiced corporate law for seven years with Cleary Gottlieb Steen & Hamilton. She lives in New York with her husband and two sons.